Charles Darwin was not much of a scientist. According to Tom Wolfe, Darwin was a story-teller with an interesting story that wasn’t even his own: He filched the story in substance from naturalist Alfred Wallace. Wallace had mailed his paper on the theory of evolution to a friend who was connected to London’s esteemed Linnean Society. Unfortunately for Wallace, the friend was Charles Darwin. Darwin had mused on similar evolutionary ideas for some time but had never published anything on the subject. He had just enough time, however, to produce an abstract of an unwritten paper so that his “findings” could be submitted alongside Wallace’s. And because Darwin was a friend of the Society in London, and Wallace was sitting in a bungalow in the Malay Archipelago fighting malaria, Darwin’s submission was read first. Darwin struggled harder and failed harder to come up with an acceptable explanation of human speech. But his views remained essentially state-of-the-art until Noam Chomsky showed up with another cosmogonic pronouncement: that humans have an innate “language acquisition device” or “language organ” somewhere in the brain (it’s anybody’s guess where). Chomsky proposed that this organ allows humans to learn language intuitively, and that it works because all languages have a basically identical recursive structure. Meaning that a sentence in any language can contain linguistically complete sub-sentences, and sub-sub-sentences, and so on. Chomsky wasn’t pleased when a naturalist-linguist named Daniel Everett published in 2008 about an untouched South American culture whose language lacked the supposedly universal “recursion” feature. But Chomsky’s theories haven’t changed, and his credibility in his largely romantical-fictional field hasn’t changed either. So how, in reality, did man learn to speak? We don’t know. 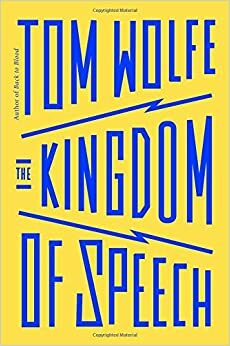 The Kingdom of Speech, by Tom Wolfe. Hachette, 2016, 185 pages.